Whether you are newly promoted or an experienced leader, there is always more to master so you are achieving your potential with those you oversee. There is a reason the literature database is overwhelming and never-ending on the topic of leadership. There is much to know and no cookie-cutter approach to mastery! Leadership resides in the mind of those who follow, so it is critical to know your audience and possess polished, interpersonal relationship skills. You must have some different strategies to choose from and you must “Lead Yourself First” to effectively lead others. Contemplate, practice and acquire basic competencies that will help an individual effectively lead and manage self and others. Learn some new practices that will pay dividends toward being a more effective leader. Vision – because it is absolutely necessary to have a plan and be strategic to achieve individual potential and lead others. Mindfulness – incorporating elements of positive psychology, laser-sharp focus, and mitigating stress. Workplace Relationships – because all leaders and managers will be immersed in many relationships and must master some core competencies to be both intra-personally and interpersonally effective. Growth – because everyone needs to continually improve to be their best. 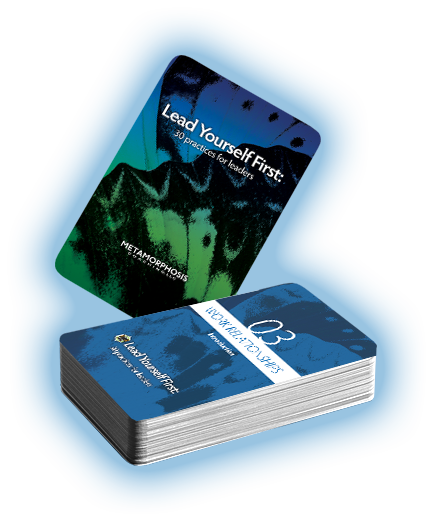 Inspiration for “Lead Yourself First: 30 practices for Leaders,” comes from my vocational and life experiences, as well as basic Leadership methodology. There are also mentors, role models, colleagues, and researchers who inspired me on some level. My experiences in leadership roles and as a performing musician provide a synergy and complementary blend. In my mind, being an effective leader is a lot like being the conductor of an orchestra, where it is necessary to listen to all the different instruments, and then provide strategy and direction to facilitate a great performance. Although I’m not a conductor, I am a musician, play regularly under the direction of a conductor and must listen to myself, and apply the conductor’s recommendations to contribute to a great performance. So, whether it is my past experiences as an executive administrator in career colleges, my time as a musician where I’m always observant of my contributions and overall impact upon performance, or the leveraging of my experiences as a leadership coach, I’m always trying to do my best to listen, collaborate, fine-tune, and work toward excellence in performance and maximizing potential.